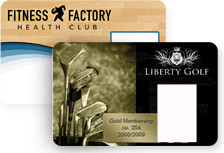 AlphaCard's pre-printing program guarantees the highest-quality cards without any hassles. Use your own design, or work with our professionalsto create a custom design for your organization. Learn more about our Custom Card Design Service. Need individualized cards? 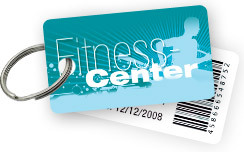 You can easily add text or photos to pre-printed cards with your own ID printer. 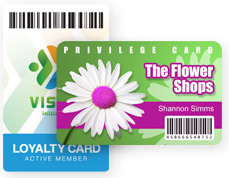 Premium Print Quality: Custom pre-printed cards are professionally printed on industrial printing presses — the result is a premium quality that outshines standard ID card printers. 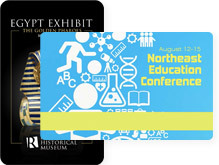 Lower Cost for Large Print Jobs: Pre-printed cards can offer a substantial cost savings on large jobs. 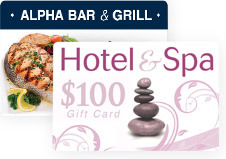 The minimum order size is 250 cards, but jobs over 500 cards see the most savings. Save Time & Hassle: Instead of spending days printing your own cards, we'll do all the hard work for you and promptly deliver the completed cards. 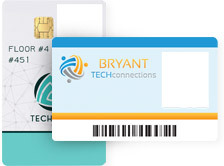 Static Card Design: Each order of pre-printed cards must be identical without personalized information or card holder photos (barcodes and/or serial number are an exception to this rule and can be unique for each card). 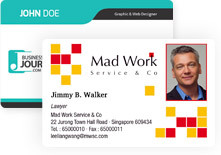 Personalize Later with an ID Card Printer: If your company has an ID card printer, you can easily print on pre-printed cards to add information or photos on demand. Learn more about personalizing pre-printed cards. Personalized Cards: Add unique information, photos, or designs to each card using your own printing system. Unlike pre-printed cards that must all be identical, with your card own printer there are no limits on the variations you can create. No Card Minimum: While pre-printed orders have a minimum of 250 cards, you can print a small batch or even a single card with your own system. Print On Demand: Print your own cards instantly without any wait time. Lower Cost for Small Jobs: If you need less than 500 cards at a time, owning your own card printer will save you money. Get an instant quote from our ID experts by filling in the form below. Our friendly, no pressure ID experts are here to help you get started.